THE MARTINI CHRONICLES: 3 Reasons Why I'm Happy For The Richard Sherman Rant! 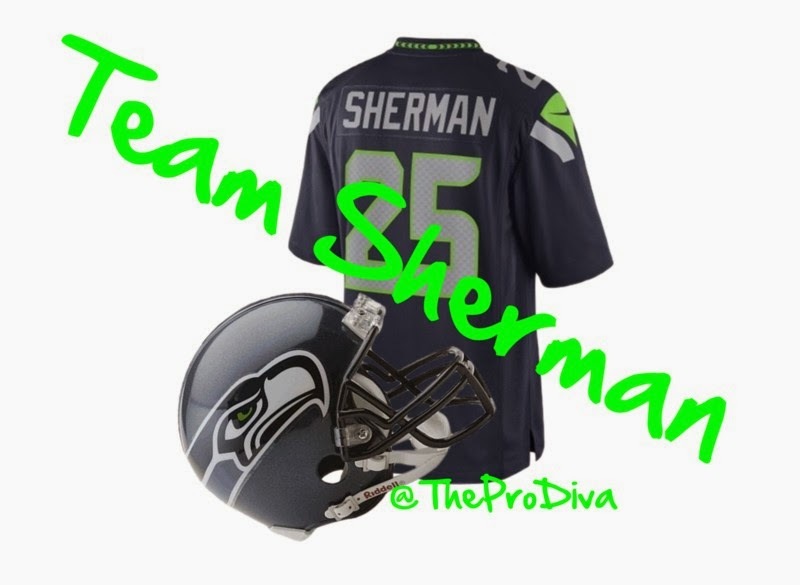 3 Reasons Why I'm Happy For The Richard Sherman Rant! 1. It forced the world to take note of his accomplishments. - Yes, Richard Sherman is a pretty great cornerback who plays for the Seattle Seahawks, the newly-crowned NFC Champions. And by extension, he gets to wear what I believe are the best uniforms in the entire NFL. But before he ascended to his current role, he was a scholar athlete at Dominguez High School in Compton, California. He played football, was on the track and field team, and graduated second in his class with a 4.2 GPA. And then he went on to Stanford University, where he earned a communications degree...he played football there, too....and was on the track and field team. I believe I read somewhere that he is pursuing his Master's...overachiever! So to recap: Richard Sherman was born and raised in one of the most dangerous cities in the United States...Richard Sherman was Salutatorian of his high school class, along with being a star athlete in two sports...Richard Sherman graduated from arguably one of the most prestigious universities in the world, while excelling in two sports. I share all of this so that you can consider these facts alongside a few others: Richard Sherman was not among the 30+ active NFL players who were arrested in the 2013 off-season...Richard Sherman has never cursed in a post-game interview...Richard Sherman has never been arrested. So what's my point? Without the Richard Sherman post-game interview, the media may not have taken it upon itself to dig into his past to see his extraordinariness. Which is what many people, including myself, were prompted to do after seeing the interview. And how wonderful it must have been to learn that Richard Sherman was NOT a "thug," or an "idiot," or any other derogatory word several media outlets used to describe him following the interview. How dare this educated athlete not fit the mold that the media prematurely applied to him. How raggedy of him! The real truth is that the Richard Sherman post-game interview forced the media to take note of and highlight Richard Sherman's accomplishments in life. After all, no one likes a one-sided story. Especially a story where an individual's accomplishments far outweigh an isolated "rant." 2. It reinforced the timeless "don't judge a book by its cover" mantra. - Immediately following the interview with Erin Andrews, the social mediaverse went crazy! I will not use this platform to highlight some of the ignorant comments and names that were attributed to Richard Sherman on Twitter and Facebook, but let's just say that they were brutal...and as it turns out, a bit premature. You see, the mistake that many members of the social mediaverse made was judging Richard Sherman based on his behavior immediately following the biggest play of his career. During the interview we saw a man who had played a major role in his team winning the game and heading to the Big Show. I think it is safe to say that he was beyond excited and that adrenaline was at an all-time high. Confetti was everywhere, everyone was celebrating, and then here comes Erin. Now, I don't know what Erin and the media were expecting, but what I saw was not surprising. I saw a man who seconds before made a spectacular play that sent his team to the Super Bowl. I saw a man who was fresh off of a trash-talking rant with a member of the opposing team...nothing unusual when it comes to competitive sports. With all of these factors in play, I saw nothing overly-unusual about Richard Sherman's interview with Erin Andrews. But the social mediaverse, though...the social mediaverse was up in arms! I wonder how silly the prejudgers felt when it turned out that Richard Sherman is not a thug or an idiot. I wonder how many of the prejudgers are willing to admit that they were wrong. 3. More folks now know about Blanket Coverage. - As I stated before, the Richard Sherman "rant" prompted the public to do some research on the man. In doing said research, we learned more about Blanket Coverage: The Richard Sherman Family Foundation. The purpose of Blanket Coverage is to "help as many kids as possible have adequate school supplies and clothes." How fabulous is that! And thanks to the Richard Sherman post-game interview, more people are aware of the foundation. Check out this video! You know you are preaching to the choir here! Yes....I am well aware of how you feel about Shermy! LOL!